We are always looking for fun ways to learn our sight words and to improve Ethan's reading skills. One of the first activities that we did when Ethan brought home his sight words from school was to feed them to a toy monster that we had, so that was our inspiration for our cute penguin reading activity. First I cut a diamond shaped hole into the cardboard tube, this would be the penguins mouth. Next I covered 2 sheets of black card with glue and wrapped them around the cardboard tube. Then while the glue was drying I wrapped elastic bands around the tube to keep the card in place. Once the glue was dry I found the spot where the hole was and cut a cross into the card, then folded the card back along the sides and glued it to the inside of the tube. Next I cut the orange foam sheets into pointed shapes for the beak and smaller curved shapes for the penguin's feet. I used double sided tape to stick these into the penguin's mouth for the beak and at the bottom of the tube for the feet. Then I stuck the goggly eyes on above the beak and cut a piece of white card into a curved shape and covered it in glue then stuck it to the penguin. Again I used elastic bands to keep it in place whilst the glue dried. I then typed up Ethan's current set of sight words onto fish shaped clipart and cut the shapes out for him. Then when he came home from school the penguin was dry and the words were ready to be read and fed to the penguin. 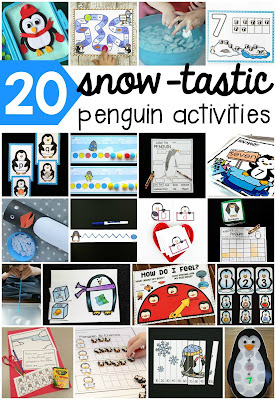 Ethan really likes his sight word eating penguin, it's a really quick and simple way to make reading sight words more fun. 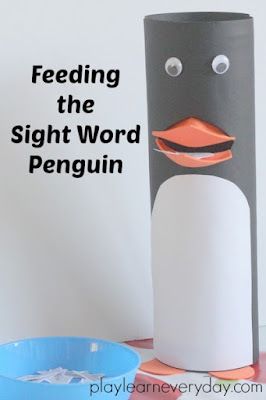 He was more than happy to read the words again and again, happily taking the words out of the bottom of the cardboard tube and feeding the penguin his fish words over and over. These words are definitely sticking in his head better than usual, and it will be a great way to review all of his sight words as well as introducing new topical word sets when we get them. 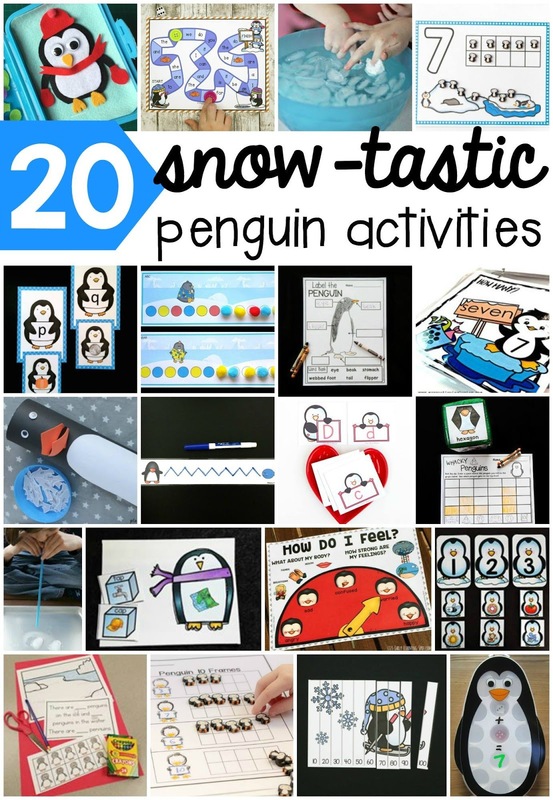 This post is part of a kids activities blog hop, this month there are loads of fantastic ways to play and learn with penguins, check them out!